So your Boss just called you into her office to discuss her brand new marketing strategy. Her plan incorporates designing a new website, a new logo and entirely new marketing materials for the company. And then she looks at you. She asks you to handle the task of setting up a new company-wide HTML email signature for your entire office that every staff member should install in their email client and use on every email that they send. You've been looking for an opportunity to shine and show that you can handle any task that's assigned to you. It sounds like a breeze, so you eagerly agree and say you'll get right onto it today. You get back into your office and sit down at your computer. 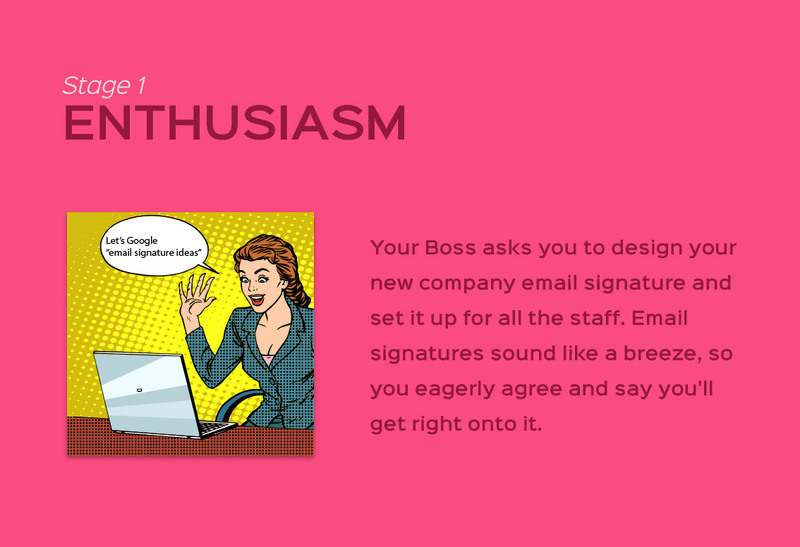 You begin to think about where to start with designing a new company email signature. You decide to have a look online so you type "email signature ideas" into Google and some really nice designs show up. The email signature designs on the screen are well designed and look really professional. You choose an email signature design you like and start trying to replicate it in Microsoft Word or Photoshop. It doesn't quite look as nice as the designs you saw online, you ask yourself "what am I doing wrong?". A few hours pass and it's time to go home for the day. You'll get back to designing the email signature tomorrow. While lying in bed that night, your mind begins to think about the email signatures again. You start thinking about how much you want to impress your Boss and your colleagues with a great email signature design. How are you going to get your design to look professional quality like the designs you saw online? 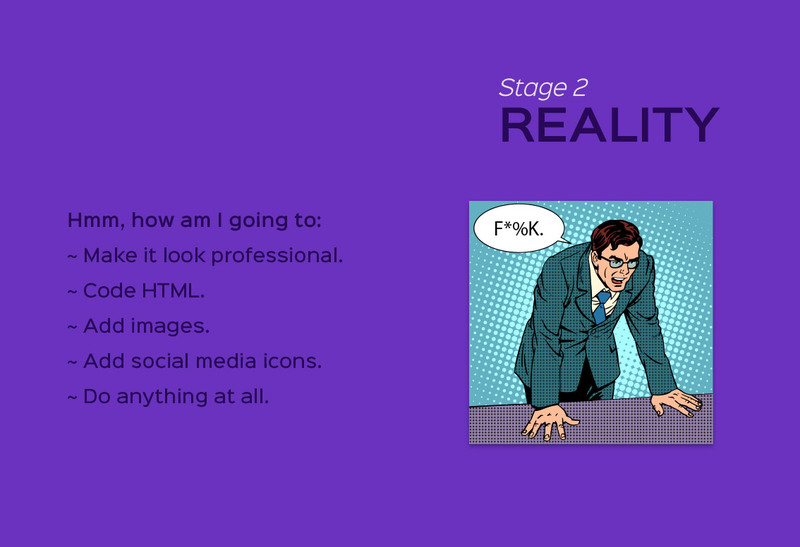 How are you going to convert your design into HTML so the links and images are clickable? How are you going to add images? How are you going to add social media icons and link them through to all the company's social networking pages? Some staff use Outlook 2007, some use Gmail, some use Thunderbird, some use Apple Mail and some even use their iPhone or iPad. How do they all install the email signature, how do I test it across all of these email clients and will it work across all of these? Will they all need my help with installation? You decide that you don't want to work yourself up before bedtime so try to stop thinking about it. You finally drift off to sleep and dream about email signatures. But by 3am, those dreams turn into nightmares and you wake up in a cold sweat. It suddenly dawns on you that this task of setting up the company email signatures is going to be a lot more difficult that you first thought and you don't want to disappoint your Boss or your colleagues with a poorly designed email signature. When you get to work the next day, the mere mention of the words "email signatures" make you sweat, turn white and want to throw up in your mouth a little. After recently discovering you know nothing about how to design HTML email signatures, you realize you're in way over your head. When it's your job to create the new company email signature and everyone in your office is running on different email clients and mobile devices, the task can seem overwhelming, scary and unachievable, even to the most competent HTML coders and designers. If your design and coding skills are somewhat lacking, you will run into issues when trying to create a nice looking, professional company email signature, that works in all of your staff's email clients and remains consistently designed across all other email clients too. There has to be a better way. 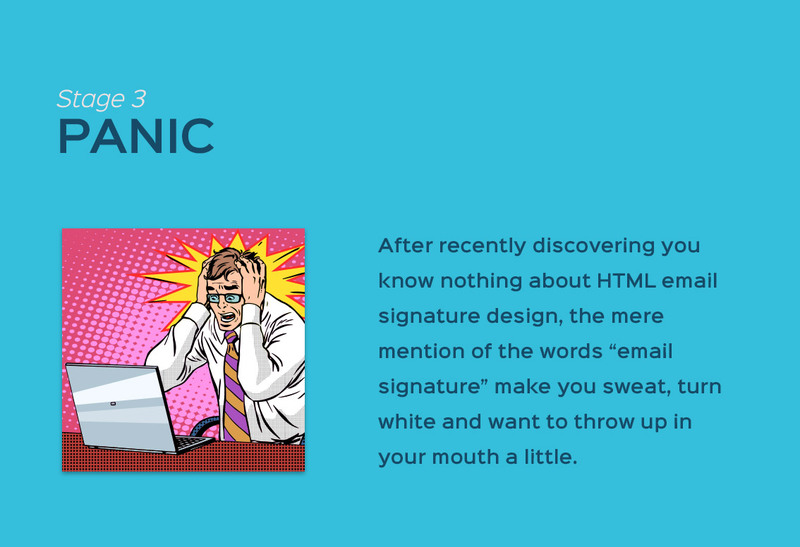 Most employees that are handed the job of setting up HTML email signatures for their company don't know what they are in for and their Boss doesn't understand the complexity involved either. Most times, it's handed off to an Assistant or Marketing Manager who really doesn't know the ins and outs of HTML email signature design. What if I told you, you can create all your employee's HTML email signatures without typing a single line of HTML code, spending any time designing it Word or Photoshop and you won't have to test it across all major email clients. What if I told you, you could create an already professionally designed, tested and coded HTML email signature template that looks amazing and is completely customized for your company in under ten minutes and it works in over 45+ email clients and apps. What if I told you, you can easily setup each of your staff member's email signatures by duplicating that template and when you are all done in only a few hours, you simply hit the "Email All" button and each employee is emailed their new HTML email signature, ready to install, complete with instructions on how to install it in all of their email programs. That's exactly what we do at Email Signature Rescue. 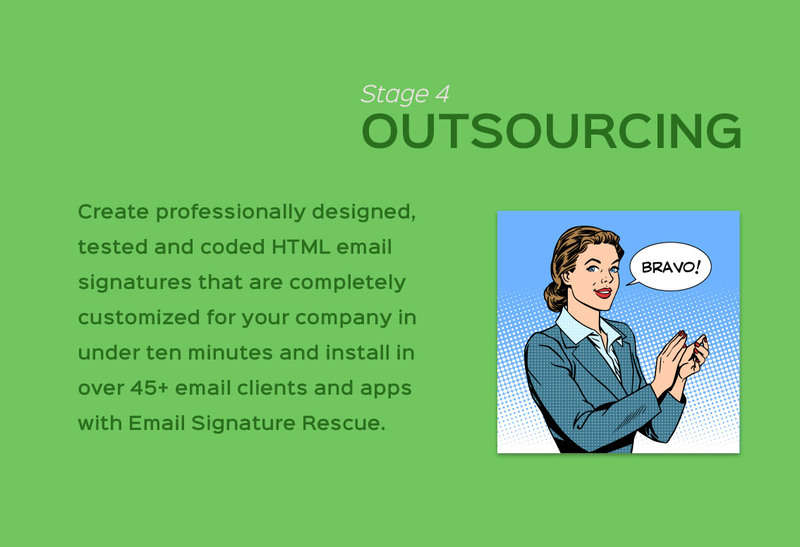 We take the hassle and the stress out of designing your company's HTML email signature. 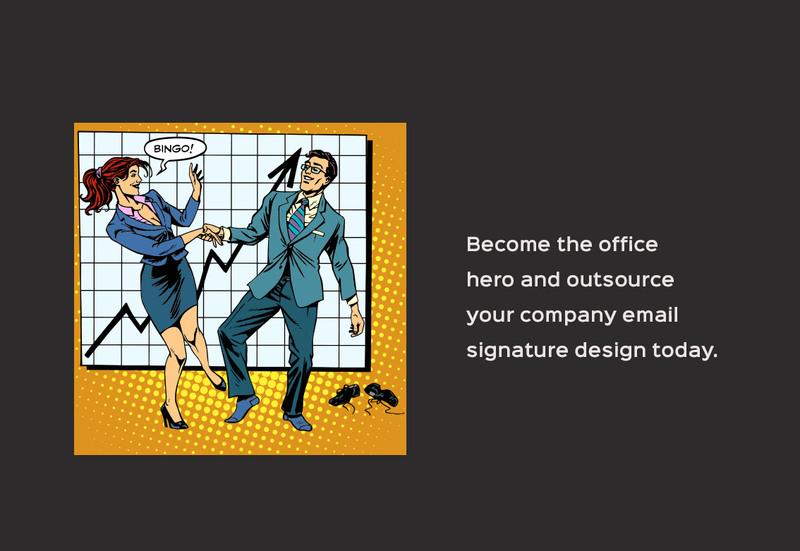 Become the office hero and outsource your email signature design today.